I strongly believe that assessment is something that should be done with students, not something that is done to students. So this year, being back in the classroom, I wanted to put that belief into practice. We have just finished our first Unit of Inquiry and here is how our summative assessment went. 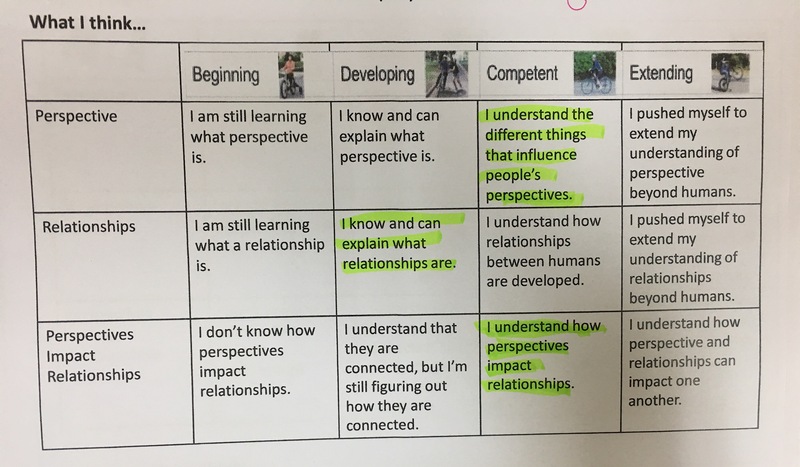 As a class we discussed the difficulty of trying to measure a human’s learning and I shared that there are many different approaches to trying to figure out what a student has learned in school. We discussed a handful of approaches for measuring learning and then we tried each of them out within the context of our unit. 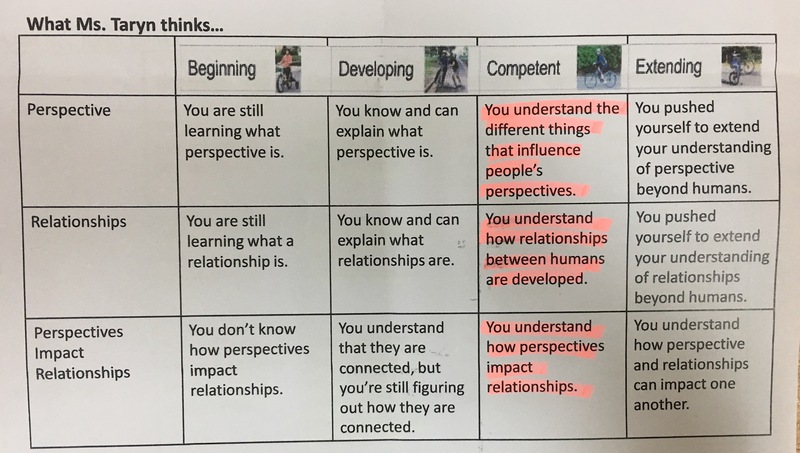 I’m also a strong believer that the learner themself best understands what they know and don’t know, so it was important to me that they had the first opportunity to assess their own understanding. 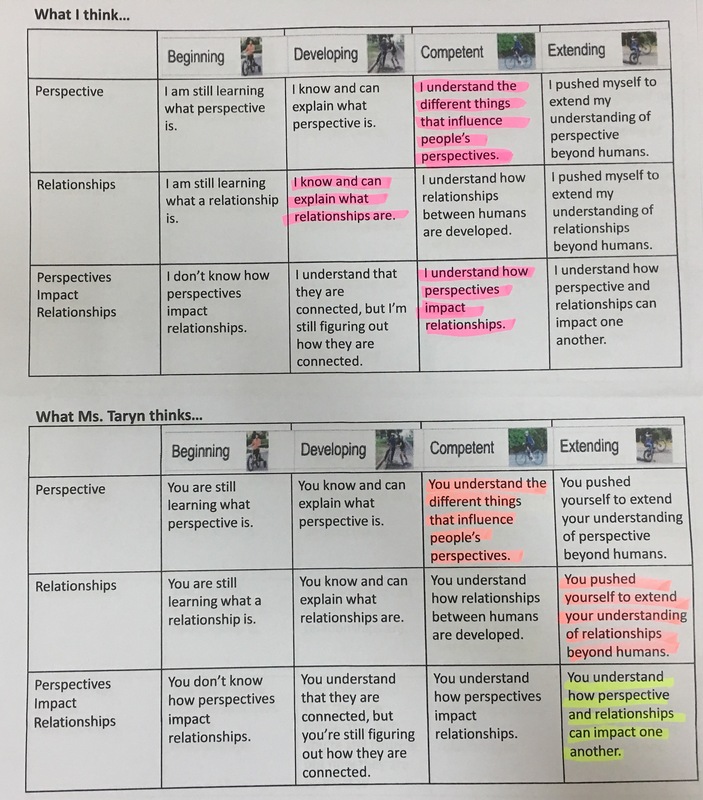 Students took the four different assessments they had completed and using those learning artifacts, marked on the rubric where they felt they were on our learning spectrum. 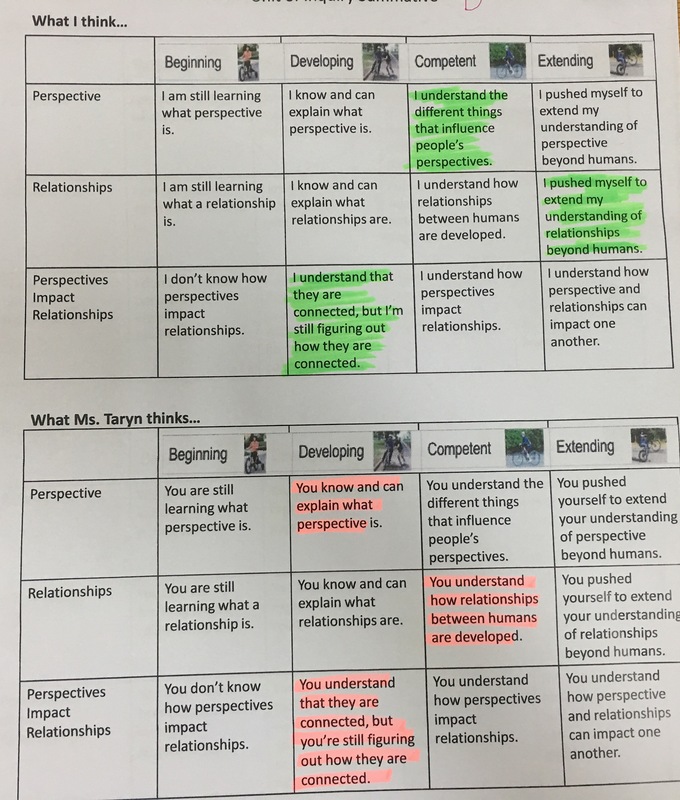 The students then gave me their 4 summative activities and their self-assessed rubric and I looked through the same learning artifacts and I added my perspective to the rubric. and one of three things happened. Either we had the same perspective and that became their final mark for the unit. Or if we had different perspective, we chatted to figure out if they new more than they were able to show on the activities, or if they thought they new more but after our chat discovered they actually had more to learn. And in some cases I needed more information because I felt I was unable to assess their understanding based on the activities they completed, so we we chatted about the concepts in the unit and the central idea to find out if they knew more than they showed. For students who had a competent understanding, we talked about how to extend themselves next unit. 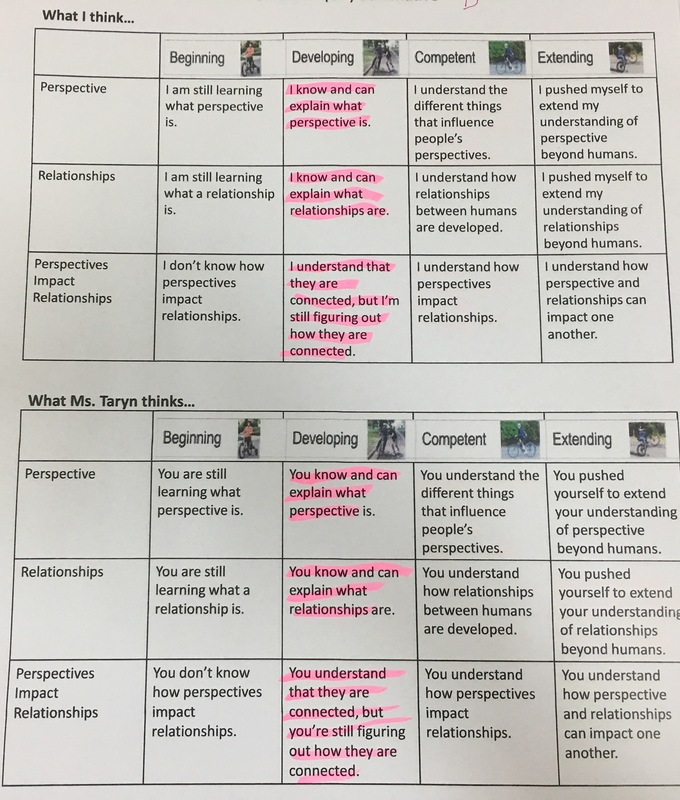 For students who were still developing their understanding, we reflected on what blocked their learning this unit and set goals for next unit. For some students that meant changing some learning behaviours (where they sit, who they learn with), for other students it meant applying more effort, and for other students it meant organizing time in addition to class time, for extra learning support from me. After the conferences were complete, I sent home to rubrics so the students could share them with their parents. I also included information about our summative process on our class blog. Parents were also invited to set-up a three-way meeting with me and their child if they wanted to discuss anything about this particular summative. All in all, it was a great process! I think my students felt empowered to have a voice in their learning and in the measurement of their learning. I think students felt their perspectives were respected and valued. I think that going through this process after the first unit of inquiry will have positive impacts on the learning that happens in our second unit of inquiry. And on a personal level, it felt much more humane and much more like a partnership in supporting their learning journey! In the past I have always partnered up my students with another class and once a week we did “reading buddies”. Students would read with their buddy and it was wonderful. However, this year I wanted to put all the decision making in the hands of my students and I realized that if I organized reading buddies with another class I was making that decision for them. First, I emailed all of our Pre-K, KG1, KG2 and Grade 1 teachers to who would be interested in having a Grade 4 reading buddy come read with their students. I had about 2-3 teachers from each grade level sign up. Then, I shared my vision with my students and offered an optional meeting for those students who were interested in being reading buddies this year. About 3/4 of my students attended. At that point I asked my students which grade they would be most interested working with and matched them up with a teacher. Then I provided each student with their reading buddy teacher’s email address. The students did an amazing job consulting our schedule in order to send an email with possible dates and times. Students were clear about how many times they would be willing to come each week. Some students chose once a week, others chose every day. Then they sent of their emails and excitedly waited for a response! Once students heard back from the teachers they solidified dates and times. Students have independantly kept track of their scheduled dates and times and done a wonderful job emailing the teacher if a conflict comes up and they are unable to make it. Now reading buddies is up and running and it has been awesome so far! Sometimes they read to one or two students, sometimes they listen to a younger student reading to them and sometimes they read to the whole class! students are loving every minute of it! I look forward to watching this progress grow and change as the year unfolds. I’m hoping word will spread and more Grade 4 students will want to become reading buddies and more early year’s teachers will want to host Grade 4 reading buddies! Yet the very thing students are “shouting out” or talking to their friends about, are the very things we are trying to get them to do as readers! So we incessantly shush them when they are organically making a prediction, connection or inference about a story… then later on in the day or week we give them inauthentic reading comprehension activities to try to illicit the very skills we shut down earlier! So when I started the year this year I vowed not to shut down the thinking that was being shared during a read aloud, but after the first few times refraining from shushing and redirecting I realized 23 students sharing their thinking out loud at the same time made it very difficult for everyone to hear the story. Then I remembered a post I read about back channeling in the classroom so I decided to give that a try. I was transparent with my students and told them I wanted them to be able to freely share their thinking about the story we were reading, but in order to do that in a way where everyone can still hear the story we will be communicating our thinking not with our voices, but through something called a back channel. We tested out back channeling in a low stakes way by chatting about our Eid vacations. Once students were comfortable with back channeling, we tried it out during a read aloud. The results were amazing! Now anytime we do a class read aloud, students hop on the back channel! We have also branched out to using a back channel when watching films and analyzing photos. It has been amazing way for student to share their thinking with one another and an amazing way for me to capture their thinking in an organic, authentic way. I shared this openly with my students. I told them the back channel was allowing me to learn so much about them as readers that we would probably never have to do a “reading comprehension activity” this year. It comes as no surprise that the issue of homework in elementary classrooms is quite the hot topic these days. In thinking about starting my year back in the classroom I decided that I – like many other teachers around the world -was going to outlaw homework! … then I began to reflect on my decision and wondered if choosing for everyone not to have homework, was any better than choosing for everyone to have homework. Either way you slice it, I as the teacher, was the owner of that decision and that was something I was no longer comfortable with in trying to achieve more democratic classroom. So I decided to take a collaborative approach and invite students and parents in on the decision making. Here is how it went! There were a range of responses and as students shared the reasoning behind their opinions, many students shifted from one group to the next. Then I invited students to watch this Alfie Kohn interview to provoke their thinking about homework. They backchannelled throughout the video to share their thoughts, questions and connections. After that, I told them that they would be deciding if they had homework – together with their families – but in order to make an informed decision we had to explore all the perspectives surrounding homework. To help with this we used to Visible Thinking Routine – Circle of Viewpoints. The “student” team posted a Twitter poll and collected tallies at recess. The “parent” team sent a Google Form home to all the parents. The “teacher” team walked around the school and collected quotes from teachers about homework. The “administrator” team sent the principal, assistant principal and superintendent an email. The “media” team explored articles and videos I shared with them. The “other schools” team browsed this school’s blog about their homework inquiry. The “our school” team looked at the homework policy in the school handbook. Once all the teams had their data they had to go through it and decide what was important, what was worth taking note of and how they were going to consolidate and display it. Then we put it all together and emailed this Google Slideshow home to our families. From there, families explored all the perspectives together and made a decision about whether or not they wanted homework in Grade 4. I pulled together the 9 students that opted to have homework this year and together we used the Start With Why framework to make a plan. First students focused on why they wanted homework, then how they wanted it to work, then finally what specifically they would do to accomplish those goals. Next, I provided feedback about their plan and then they brought it home to get feedback from their parents as well. Now we are finally ready to put these differentiated, student-led, family supported homework plans into action! Now that it is all over, I can rest assured that the students and families who want homework have it and the students and families who don’t want homework don’t have it. Everyone is happy and the ownership and control rests with the learners themselves… as it always should. Best. First Month of School. Ever. So the first month of school has come and gone… and what a month it was! Yet I have to admit, I had an internal struggle. The teachery teacher side of me kept saying “Hurry up! Move along! There is content to get to! You are behind your team! 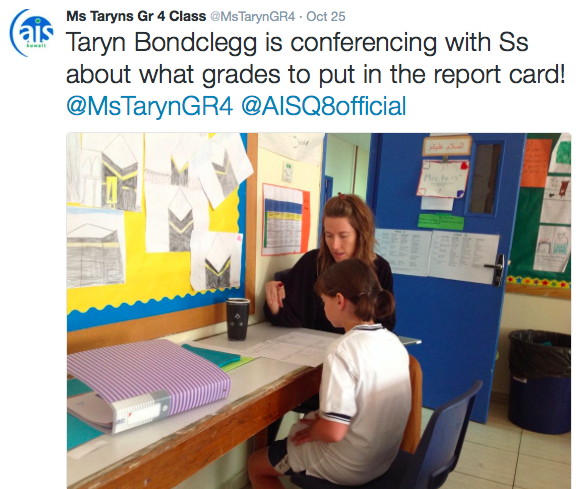 Report cards are coming!” While the inquiry-teacher side of me kept saying “Slow down. What’s the rush? Follow your students. Notice the learning that is happening everyday.” Thankfully the second voice won out, in large part because I kept constantly referring back to Finland’s model of easing into the school year as a source of inspiration and reassurance. We inquired into our perspectives at the moment about schools, teachers, reading, writing, math and UOI…. All throughout our first month together I intentionally looked for learning throughout the day and documented it each night. I have learned so much about my students not only as readers, writers, mathematicians and inquirers… but also as humans. Just for fun, I thought about everything that has happened this past month and wondered how many curricular expectations were authentically explored throughout our various inquiries… to satisfy the slowly disappearing teachery-teacher side of me… and anyone else who might ask! C1.4.4 explain how groups of people make rules to create responsibilities to protect a safe environment. C1.4.6 describe ways in which people benefit from and are challenged by working together, including through government, workplaces, voluntary organizations, and families. C2.4.3 identify appropriate deliberative processes when making decisions or reaching judgments as a group. C3.4.3 explain how procedures are developed to address community problems. E1.4.1 identify the benefits and costs of individual choices. G1.4.1 construct maps and other graphic representations of both familiar and unfamiliar places. G1.4.2 use maps, satellite images, photographs, and other representations to explain relationships between the locations of places and regions. PS3.4.1 use evidence to construct an explanation relating the speed of an object to the energy of that object. ED1.3-5.1 define a simple design problem reflecting a need or a want that includes specified criteria for success and constraints on materials, time, or cost. ED1.3-5.3 plan and carry out fair tests in which variables are controlled and failure points are considered to identify aspects of a model or prototype that can be improved. Solve multistep word problems posed with whole numbers and having whole-number answers using the four operations, including problems in which remainders must be interpreted. Know relative sizes of measurement units within one system of units including km, m, cm; kg, g; lb, oz. ; l, ml; hr, min, sec. Use the four operations to solve word problems involving distances, intervals of time, liquid volumes, masses of objects, and money, including problems involving simple fractions or decimals, and problems that require expressing measurements given in a larger unit in terms of a smaller unit. Apply the area and perimeter formulas for rectangles in real world and mathematical problems. Communicating – exchange of information with various audiences using a range of media and formats. Collaborating – Learners are empowered through digital media and environments and through active participation in creating and sharing knowledge. Organizing – Learners make connections, transfer existing knowledge and independently explore new technologies. Becoming responsible digital citizens – using ICT to make informed and ethical choices while acting with integrity and honesty. In a globally connected digital world, learners are empowered to be responsible for their actions, to value others’ rights and to practise safe and legal behaviours. One month… no “school work”… but lots of learning!